It’s just me and the dude for two weeks while papa goes on an exciting adventure playing bass with Nicki Bluhm and the Gramblers. It’s a great gig for him. I get to have solo snuggles with my favorite snuggler. We will miss papa, though. We had oatmeal for breakfast. Cooked in our kitchen with food from our fridge. These are some of my small joys, after living in a car for the lion’s share of 5 years, even our tiny house is heavenly ours. We can leave the bed unmade. Leave the toys in the tub. Leave the dishes in the sink. It’s an incredible blessing to have a small part of the world in which to nest. 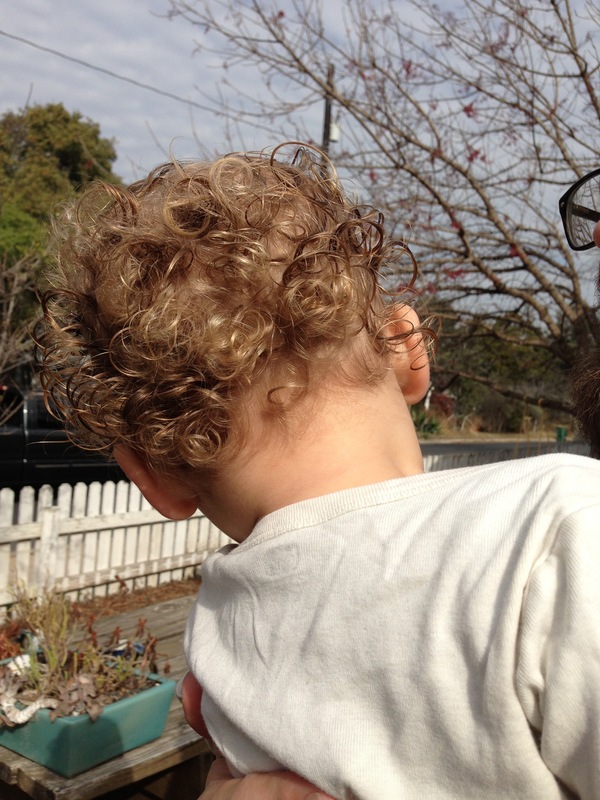 Emmett has my curly locks and my coloring. Other than that he’s a small replica of his daddy. It’s the sweetest thing to see them asleep next to eachother. This morning we gave Emmett his first haircut. His little ringlets easily intertwine and form dreadlocks. I believe that to be or to not be a hippie is every person’s personal choice. He’s yet too young to be well informed enough to choose a life of Phish parking lots and bong hits. We will let him figure that our in his teens. So trim his 14 month-old hair I did. In our front yard. Its almost spring in the hill country, gloriously closer to the equator than where i grew up. Here’s a picture of pre haircut. nap time is the best time. this quilt was hand sewn by my cousin. Hullo, nice to meet you! Papa ~ Andrew Pressman, originally from Carmel Valley, CA on bass, management, phone calls, meat cooking, van packing, lettuce-free, solid as a rock solutions. Mama ~ Raina Rose, originally from Portland, OR on vox guitar & songwriting, social media-ing, gluten-free, sweet potato & kale cooking, joyous minimalist. Baby ~ Emmett Rose Pressman born in Austin, TX in November of 2011, on giggles, yogurt, stumbly mumbly, road tested, good attituded tiny monster. Pup ~ Hopi, found in Arizona, a deserted desert mutt turned glorious folk hound. We are independent musicians living in Austin, TX the Live Music Capital of the World. Emmett has proven to be an able traveler. As of the end of 2012 he’s been to over 68 gigs, 7 music festivals, 3 recording sessions, 2 conferences, 18 states and 2 Canadian provinces. This is the ongoing story of our lives together on the road, attempting to stay healthy & loving while making great music and running after the New American Dream. Just a modern family from Austin, TX made up of a bass player, folksinger, tiny man, and doggie attempting to live healthy, whole & well while making beautiful music together on the road.